*Shamanism workshops, *shamanic training, medicine crafts, healing, drumming, one-to-one coaching, firewalking, glasswalking, empowerment & mind, body, spirit events in Spalding, Lincolnshire, Peterborough, Cambridgeshire, Bedfordshire, the UK & beyond. Hello beautiful soul. Thank you for visiting Firechild's website - we hope our online home provides the answers you seek. Operated by shamanic practitioner, author, speaker and extreme empowerment specialist Taz Thornton, Firechild is all about personal growth and empowerment. Based in the heart of the Lincolnshire fenlands, Firechild is dedicated to following the old ways as much as possible, working with the ancestors and living in harmony with the wonderful energies of these celtic lands. Our workshops are safe, grounded and run with laughter and lightness in our hearts. Our ongoing training programmes, such as the One Year Shamanic Circle, include on and offline support, as well as creating a strong tribe of people to work, share, and grow with. Training brings together traditional shamanism as well as a few modern empowerment techniques to help you step into your power in today's Western world. We also offer one to one shamanic coaching as well as energy healing. Coaching sessions can be face to face, via telephone or even Skype and are conducted by Taz. Shamanic healing services may be provided by Taz, or by one of a trusted team of practitioners, all trained by Taz herself. 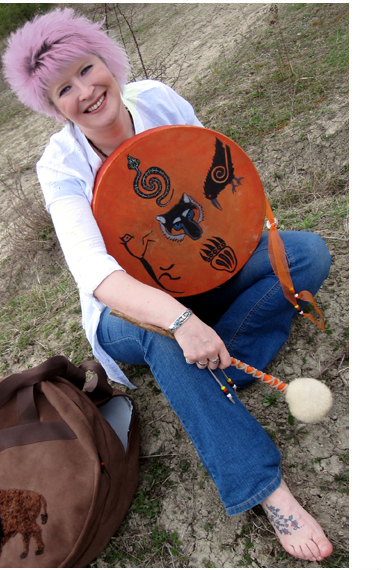 For those wanting to let their own creative juices flow, we run workshops and one to one sessions at the Firechild Shamanic Crafts Studio in Spalding, Lincolnshire; these include drum and rattle birthing, staff and wand creation and medicine jewellery. Taz also occasionally channels and creates a range of medicine crafts, which can also be commissioned on an individual basis. * A note about the words 'shamanic' and 'shamanism'. Taz uses these terms as they've fallen into common usage by those looking for a certain kind of animism/energy based teachings. However, Taz has never adopted the title of shaman, as she does not feel the title is the perfect one for the path she follows. The spiritual traditions of our British shores have been eroded over time, though the energies and spirits of the land are still strong for those seekers willing to search for them. In time, she hopes a descriptor more appropriate to her home lands will come forth, be understood and fall into common usage. Until that time, Taz uses the word 'shamanism' to describe her work, so those wishing to follow the path might be able to search and find her.